Is your pet having a bad breath or inflamed gums? 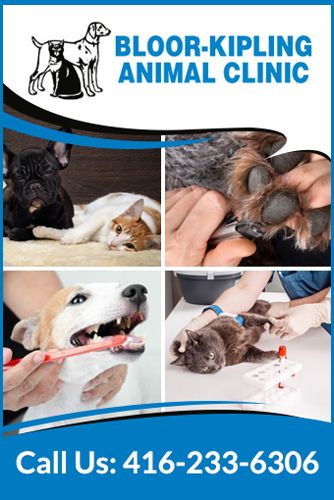 If yes, Bloor-Kipling Animal Clinic is here to provide effective pet dental cleaning services. We have a team of dental veterinarians in Etobicoke who are qualified to treat the oral health issues in your dogs, cats and other pets. From regular dental exams to tooth extraction, we make sure your pet enjoys a good oral health without any plaque or weak tooth. Ours is a local animal hospital that is equipped with the latest oral surgical equipment and tools to ensure safe dental procedures for your four legged in a hygienic environment. Our preventative dental cleaning ensures long-term health and prevents the risk of falling victim of diseases that spreads through the mouth. Schedule routine dental cleanings as recommended by a vet. Brush or floss your pet’s teeth daily or twice a week. Serve healthy pet food to promote good overall health. Call Us To Schedule A Pet Dental Care Exam!